"This is a simple side dish to prepare and serve with Asian dishes. We love it with grilled tuna." In a medium skillet over medium heat, cook the sesame seeds about 5 minutes, stirring frequently, until lightly browned. Remove from heat, and set aside. Heat oil in the skillet over medium high heat. 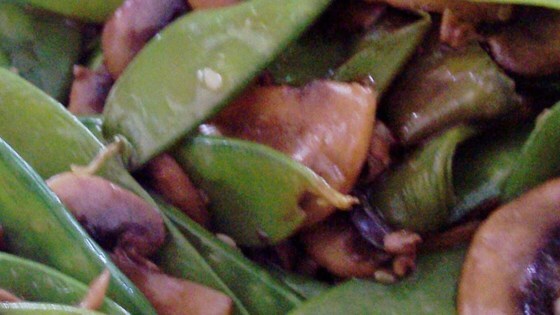 Stir in snow peas and mushrooms, and cook 3 to 4 minutes, until tender. Transfer snow peas and mushrooms to a medium bowl. Toss with sesame seeds and teriyaki sauce, and serve warm. Light, gingery sauce over stir-fried beef. This was pretty good, but I added bean sprouts, baby corn ears, and upped the amount of teriyaki sauce. I served it at a dinner party and everyone loved it that way! This was really good, but purchased teriyaki sauce can be a bit too thick and rich, overwhelming the poor mushrooms. Try with a mix of soy sauce, sake and mirin (sweet sake) istead. The adults loved this! Great with grilled salmon.